China will host the two-day One Belt, One Road (OBOR) Forum, also known as the Belt and Road Forum (BRF), in Beijing from May 14 to May 15. As usual, China’s state media are releasing a big wave of articles and videos to promote the highest-level event. What’s unusual this time is that the focus is more on Chinese President Xi Jinping rather than on the Forum itself. 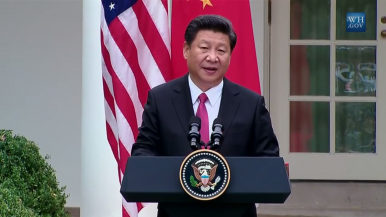 On May 11, Xinhua News Agency and People’s Daily, China’s two most important state media, jointly launched a video and article called “Xi Jinping on the world stage,” claiming that “the world will focus its eyes on Xi Jinping, once again” during the BRF. It is also the front page headline of the Xinhua website. According to the video, the first impression Xi leaves on many foreign friends is his “amiable [disposition] with a human touch.” To further demonstrate that Xi “impressed the world in the past four years,” the video then quotes at length from Xi’s poetic words, witty phrases, and cultural expressions said in various occasions home and abroad. The world has never been more eager to approach China and listen to China. Xi Jinping takes China to the center of the world stage! Where does the OBOR Project come from? What is the profound meaning of OBOR? How to develop the OBOR project? What does OBOR bring to the world? Actually, the article is only a tiny part of a comprehensive special program — “Learning From Xi.” In the program, carefully designed by Xinhua, each and every one of Xi’s public speeches, visits, meetings, phone calls, instructions, pictures, and videos are shown in the form of big data; Xi’s catchphrases such as “China Dream,” “One Belt One Road,” and “rule the party strictly” are highlighted; Xi’s quotes are made into a calendar for readers to memorize day by day; and Xi’s eight books are presented on an electronic bookshelf. In addition, a handful of experts and scholars gave their in-depth interpretations of Xi’s important words. In fact, the target audience of this propaganda in various forms is not limited to Chinese nationals. It is noteworthy that the video mentioned in the beginning provides not only Chinese subtitles but also English (though the English version is slightly lower-key on some eulogistic expression). It means the video is actually a stone thrown to hit two birds: a domestic audience as well as a foreign audience. It also shows China, along with Xi himself, is becoming more and more confident in public promotion. What Did Chinese People Think of the Belt and Road Forum?What Did China Accomplish at the Belt and Road Forum?One Belt, One Road, One Language?China's Premier Li Tours Australia, New ZealandIs the Belt and Road Initiative Globalizing China’s National Security Policy?